Definition at line 132 of file llviewerpartsim.h. Definition at line 139 of file llviewerpartsim.h. Definition at line 140 of file llviewerpartsim.h. Definition at line 443 of file llviewerpartsim.cpp. References LLControlGroup::getS32(), gSavedSettings, mID, LLMemType::MTYPE_PARTICLES, and sMaxParticleCount. Definition at line 452 of file llviewerpartsim.cpp. References count, i, LLMemType::MTYPE_PARTICLES, mViewerPartGroups, mViewerPartSources, and S32. Definition at line 160 of file llviewerpartsim.h. Definition at line 493 of file llviewerpartsim.cpp. References MAX_PART_COUNT, LLMemType::MTYPE_PARTICLES, put(), and sParticleCount. Definition at line 691 of file llviewerpartsim.cpp. References llendl, llwarns, LLMemType::MTYPE_PARTICLES, and mViewerPartSources. Definition at line 707 of file llviewerpartsim.cpp. References i, LLMemType::MTYPE_PARTICLES, and mViewerPartGroups. 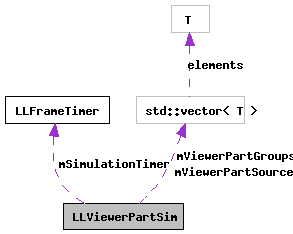 Definition at line 722 of file llviewerpartsim.cpp. References g, i, LLMemType::MTYPE_PARTICLES, mViewerPartGroups, and mViewerPartSources. Definition at line 740 of file llviewerpartsim.cpp. References clearParticlesByID(), LLMemType::MTYPE_PARTICLES, and mViewerPartSources. Definition at line 545 of file llviewerpartsim.cpp. References LLViewerPartGroup, LLMemType::MTYPE_PARTICLES, and mViewerPartGroups. Definition at line 165 of file llviewerpartsim.h. Referenced by LLViewerPartGroup::removePart(), LLViewerPartGroup::updateParticles(), and LLViewerPartGroup::~LLViewerPartGroup(). Definition at line 163 of file llviewerpartsim.h. Definition at line 156 of file llviewerpartsim.h. Definition at line 164 of file llviewerpartsim.h. Definition at line 503 of file llviewerpartsim.cpp. References addPart(), calc_desired_size(), count, createViewerPartGroup(), i, LLVector3::isFinite(), LLPartData::LL_PART_FOLLOW_VELOCITY_MASK, llassert_always, llendl, llinfos, llwarns, LLVector3::magVecSquared(), LLPartData::mFlags, LLViewerPart::mPosAgent, LLViewerPart::mScale, LLMemType::MTYPE_PARTICLES, LLVector2::mV, mViewerPartGroups, NULL, and S32. Definition at line 702 of file llviewerpartsim.cpp. Definition at line 162 of file llviewerpartsim.h. Referenced by LLFeatureManager::applyRecommendedFeatures(), and LLMaxPartCountListener::handleEvent(). Definition at line 556 of file llviewerpartsim.cpp. References count, i, mViewerPartGroups, mViewerPartSources, and S32. Definition at line 470 of file llviewerpartsim.cpp. References f, FALSE, ll_frand(), MAX_PART_COUNT, LLMemType::MTYPE_PARTICLES, sMaxParticleCount, sParticleCount, and TRUE. Definition at line 584 of file llviewerpartsim.cpp. References count, dist_rate_func(), f, LLFastTimer::FTM_SIMULATE_PARTICLES, LLDrawable::getCurrentFrame(), LLFrameTimer::getElapsedTimeAndResetF32(), gPipeline, LLPipeline::hasRenderType(), i, LLDrawable::IN_REBUILD_Q1, LLSpatialGroup::isVisible(), ll_frand(), LLPipeline::markRebuild(), mID, LLMemType::MTYPE_PARTICLES, mViewerPartGroups, mViewerPartSources, LLDrawable::REBUILD_ALL, LLPipeline::RENDER_TYPE_PARTICLES, S32, start, and TRUE. Definition at line 158 of file llviewerpartsim.h. Definition at line 167 of file llviewerpartsim.h. Referenced by LLViewerPartSim(), and updateSimulation(). Definition at line 176 of file llviewerpartsim.h. Definition at line 174 of file llviewerpartsim.h. Referenced by cleanupRegion(), clearParticlesByID(), createViewerPartGroup(), put(), shift(), updateSimulation(), and ~LLViewerPartSim(). Definition at line 175 of file llviewerpartsim.h. Referenced by addPartSource(), clearParticlesByID(), clearParticlesByOwnerID(), getParticleSystemList(), removeLastCreatedSource(), shift(), updateSimulation(), and ~LLViewerPartSim(). Definition at line 177 of file llviewerpartsim.h. Referenced by aboveParticleLimit(), getMaxPartCount(), LLViewerPartSim(), setMaxPartCount(), and shouldAddPart(). Definition at line 178 of file llviewerpartsim.h. Referenced by aboveParticleLimit(), addPart(), decPartCount(), incPartCount(), and shouldAddPart().